The Norwegian Lundehund originates from the Loefoten Islands of Norway. A beautiful region, the Loefotens are famous for their many cliffs and jagged coastline. 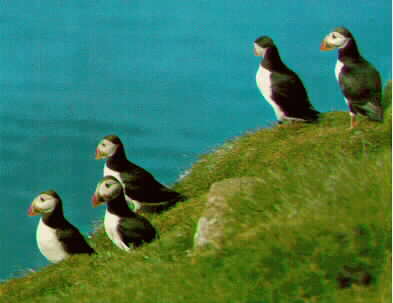 The Puffin, a small aquatic bird, nests high in these cliffs. Norwegian farmers hunte d Puffins for their meat and soft feathers. 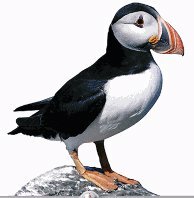 They used Lundehunds to hunt the Puffins (Lundehund in Norwegian means Puffin Hound.) Because of the Lundehund´s unique features they are able to scale the cliffs and navigate the caves that the puffins dwell in.The farmers would keep large numbers of the lundehunds and breed only the best puffin hunters. A good Puffin hunter was as valuable as cattle. 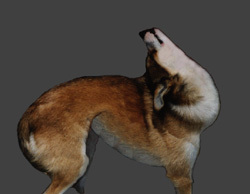 It is believed that the Lundehund or a close relative survived the last Ice age. That would make them an ancient breed. They already qualify as a Primitve breed. When Puffin hunting became illegal, the breed slowly died off, this was helped along when Norway had a distemper out break, until there were only 5 dogs left. All Lundehunds that exist today are desended from those 5 dogs! These days there are an estimated 2000 Lundehunds worldwide. The majority of these dogs are in countries such as Norway and Finland. There are about 300 Lundehunds in the US. The American Kennel Club (AKC) does not recognize the Lundehund, but they are recognized by the American Rare Breed Association (ARBA). The Lundehund has several unique traits. They have at least 6 toes on each foot. Their limbs can extend out to 90 degrees from their bodies. Due to extra vertabrae in their necks they can touch the top of their heads to their backs.The only other mammal with this trait is the Reindeer! They also have the ability to close their ears when they get moist. They are they only dog breed known with this many unique characteristics. Their coloring is limited to Sable. Lundies are prone to a disease called Intestenial Lymphangiectasia, or IL, Which is know know as Lundehund Syndrome or LS. With a high protein and low fat diet, this can be controlled and studies are underway to find out which dogs are prone to the disease. This is an X-ray of a lundie foot, you can see five toes, easily. If you look carefully you can see part of the sixth toe half way up the foot on the inside toes. Lots of new and exciting things are happening in the world of Lundie science. Dr. David Williams of the Texas A&M Study, is experimenting with new ideas. Seperate from the Lundehund study at Texas, some individual owners are experimenting with diets that are based on diets that "pre" domesticated Lundies might have eaten. The experimental diet is being given to IL Lundies and seems to be improving Total protein counts, but much work remains before the diet can be proven. All and all, IL is fastly becoming a disease that is not neccesarily a death sentence. A majority of owners are regularly testing their Lundie Total Protein. This is a good indication of a dogs predisposition to IL.